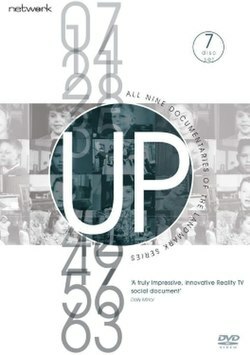 The Up Series is a series of documentary films produced by Granada Television for ITV that have followed the lives of fourteen British children since 1964, when they were seven years old. So far the documentary has had eight episodes spanning 49 years (one episode every seven years) all of which were broadcast on ITV, apart from the 6th episode which was broadcast on BBC One. In a 2005 Channel 4 programme, the series topped the list of The 50 Greatest Documentaries. The children were selected to represent the range of socio-economic backgrounds in Britain at that time, with the explicit assumption that each child's social class predetermines their future. Every seven years, the director, Michael Apted, films material from those of the fourteen who choose to participate. The last installment, 56 Up, premiered in May 2012; Apted has stated that filming for 63 Up would occur in late 2018, for release in spring 2019. Apted has also been reported as saying: "I hope to do 84 Up when I'll be 99." The aim of the series is stated at the beginning of 7 Up as: "We brought these children together because we wanted a glimpse of England in the year 2000. The shop steward and the executive of the year 2000 are now seven years old." The first film in the series, Seven Up!, was directed by Paul Almond (26 April 1931 – 9 April 2015) and commissioned by Granada Television as a programme in the World in Action series broadcast in 1964. From 7 Plus Seven onward the films have been directed by Michael Apted, who had been a researcher on Seven Up! and chose the original children with Gordon McDougall. The premise of the film was taken from the Jesuit motto "Give me a child until he is seven and I will give you the man", which is based on a quotation by Francis Xavier. The 1998 programme was commissioned by BBC One, although still produced for them by Granada Television. The subjects are first seen on a group visit to London Zoo, where the narrator announces "We brought these 20 children together for the very first time." The series, however, only follows fourteen: Bruce Balden, Jackie Bassett, Symon Basterfield, Andrew Brackfield, John Brisby, Peter Davies, Susan Davis, Charles Furneaux, Nicholas Hitchon, Neil Hughes, Lynn Johnson, Paul Kligerman, Suzanne Lusk and Tony Walker. The participants were chosen in an attempt to represent different social classes in Britain in the 1960s. Apted states in the commentary track of the 42 Up DVD that he was asked to find children at the extremes. Because the show was not originally intended to become a repeating series, no long-term contract was signed with the participants. The interviews since Seven Up! have been voluntary, although the participants have been paid an unknown sum for their appearance in each film, as well as equal parts of any prize the film may win, says Apted. Each subject is filmed in about two days and the interview itself takes more than six hours. In an interview with the BBC's Will Gompertz shortly before the broadcast of 56 Up, Apted said that it had been a poor decision to include only four female participants. Andrew Brackfield was one of three boys chosen from the same pre-preparatory school in the wealthy London district of Kensington (the other two being Charles and John). The three are introduced in Seven Up! singing "Waltzing Matilda" in Latin. At the age of seven, when asked what newspaper he reads, if any, Andrew stated that he reads The Financial Times (although he later revealed he was in fact just repeating what his father had told him when asked the same question). All three could say which prep schools, public schools and universities they planned to attend (Oxford or Cambridge in all cases); two named the specific Oxbridge college they intended to join. Andrew's academic career culminated in his studying at Trinity College, Cambridge. Andrew subsequently became a solicitor, married and raised a family. He is the only one of the three Kensington boys to have appeared in all the Up films. Both Andrew and his wife are most satisfied with how their children have turned out, followed by their relationship. Charles Furneaux did not get into Oxford, saying in 21 Up he was glad to have avoided the "prep school–Marlborough–Oxbridge conveyor belt" by going to Durham University instead; however, he later attended Oxford as a post-graduate student. Charles has worked in journalism in varying capacities over the years, including as a producer for the BBC, and in the making of documentary films, including Touching the Void. He chose not to appear in the series after 21 Up, other than the contribution of an occasional photograph. During an on-stage interview at London's National Film Theatre in December 2005, Apted alleged that Charles had attempted to sue him when he refused to remove Charles's likeness from the archive sequences in 49 Up. Apted also commented on the irony that as a documentary maker himself, Charles was the only one who refused to continue. By the time of 56 Up, all references to Charles had been removed other than in fleeting glimpses of joint shots with Andrew and John. John Brisby, who was vocal on politics by 14, attended Oxford and became a barrister. He married Claire, the daughter of Sir Donald Logan, a former ambassador to Bulgaria. Brisby devotes himself to charities related to Bulgaria, and hopes to reclaim family land there that had been nationalized. He is a great-great-grandson of the first Prime Minister of Bulgaria, Todor Burmov. Brisby said in 35 Up that he only does the films to give more publicity to his chosen charities. In 56 Up, he criticized Apted's decision to originally portray him as part of the "privileged upper class". He related that his father had died when he was 9 and his mother had to work to put him through private school. He attended Oxford University on a scholarship. As of 56 Up, he remains a litigator who feels very blessed in almost all aspects of his life. Suzanne (Suzy) Lusk comes from a wealthy background and was first filmed at an independent London day school. Her parents divorced around the time of 7 Plus Seven. She then dropped out of school at the age of 16, deciding to travel to Paris. By 21, she had formed a strong negative opinion about marriage and being a parent, though this soon changed dramatically. By 28 Up, she was married with two sons, and credited her marriage with bringing her the optimism and happiness that was not evident in the earlier films. Her husband, Rupert Dewey, is a solicitor in Bath and they have three children, two boys and a girl. She became a bereavement counsellor. In the 7 Plus Seven she stated that she thought Apted's project was pointless and silly, a point that she restated in 21 Up. At 49 Up she was convinced that she wouldn't participate again, but by 56 Up she admits an obligation to the project regardless of how she feels about it. Jackie Bassett was one of three girls (the others being Lynn and Sue) who were chosen from the same primary school, in a working-class neighbourhood of east London. She eventually went to a comprehensive school and married at age 19. Jackie went through several different jobs, divorced, remarried and moved to Scotland, divorced again and raised her 3 sons as a single parent. As of 56 Up she had been receiving disability benefit for 14 years. Her family remains close and lives near each other in Scotland. Lynn Johnson, after attending the same primary school as Jackie and Sue, went on to attend a grammar school. She married at 19, had two daughters, and became a children's librarian at 21. She later became a school librarian and remained in that position until being made redundant due to budget cuts. At 56 Up she continued to believe her career as a librarian was of great value and it helped define her life. She was a doting grandmother with 3 grandchildren, and was still married to her husband Russ whom she considered her soulmate. Lynn died in May 2013 after a short illness. Susan (Sue) Davis attended the same primary school as Jackie and Lynn and following that attended a comprehensive school. Sue married at 24 and had two children before getting divorced. She has been engaged to her current boyfriend for 14 years. She works as a university administrator for Queen Mary, University of London, despite not having gone to university herself. Tony Walker was chosen from a primary school in the East End of London and was introduced along with his classmate Michelle, whom Douglas Keay, the narrator, stated was Tony's "girlfriend". He wanted to be a jockey at 7 and was at a stable training as one by 14. By 21 his chance had come and gone after riding in three races before giving it up. He was proud to have competed against Lester Piggott. He then gained "the Knowledge", and made a comfortable life for himself and his family as a London taxi driver. His later dream of becoming an actor has met with modest success; he has had small parts as an extra (almost always playing a cabbie) in several TV programmes since 1986, including Winston Churchill: The Wilderness Years, The Bill and twice in EastEnders, most recently in 2003. His wife Debbie was carrying their third child in 28 Up and she reveals in 35 Up that she lost that baby but has since had another; she admits that losing their third child placed a tremendous stress on their relationship. Also in 35 Up, Tony admitted that being in a monogamous relationship was becoming a strain and by 42 Up he had actually committed adultery, though he and his wife have got past it and are still together. By 42 Up, he had moved to Essex and by 49 Up owned two homes, including a holiday home in Spain. Paul Kligerman was at a charity-based boarding school at 7, his parents having divorced and he having been left with his father. Soon after Seven Up! his father and stepmother moved the family to Australia, where he has remained in the Melbourne area ever since. By 21, he had long hair and a girlfriend whom he later married and remains with today. After leaving school he was employed as a bricklayer and later set up his own business. In 49 Up he is working for a sign-making company. In both 21 Up and 49 Up, Paul was reunited with Symon, who had attended the same boarding school; portions of their time together are included in both films. By 56 Up Paul had started work at a local retirement village with his wife Susan. He does odd jobs and maintenance of the small units and gardens. Symon Basterfield, chosen from the same charity home as Paul, is the only mixed-race participant. He was an illegitimate child, who never got to know his black father, and had left the charity home to live with his white mother by the time of the 7 Plus Seven filming; her depression is alluded to as the cause for his being in the home. As the filming for 35 Up was taking place, he was going through a divorce from his first wife and mother of his five children, and he elected not to take part in that film. Symon returned for 42 Up and 49 Up, remarried with one son and one stepdaughter. In 49 Up, he and his wife had become foster parents. By 56 Up, he regretted his lack of formal education, which he felt limited his income over the years. He remains happily married and looks forward to the next chapters of his life. William Nicholas (Nick) Hitchon was raised on a small farm in Arncliffe, a tiny village in the Yorkshire Dales. He was educated in a one-room school four miles' walk from his home, and later at a boarding school. He went to Oxford University and then moved to the United States to work as a nuclear physicist. He married another British ex-pat, who participated in 28 Up but was displeased with how her comments were received by viewers, many of whom apparently concluded that the marriage was doomed. She declined to appear in 35 Up and 42 Up. By 49 Up the couple had divorced and Nick had remarried, this time to Cryss Brunner, who is ten years his senior and teaches in Minneapolis. Nick is currently a professor at the University of Wisconsin–Madison in the Electrical and Computer Engineering Department. Nick appeared as a guest on NPR's quiz show Wait Wait... Don't Tell Me aired 21 June 2014, and spoke briefly about his participation in the Up Series. Peter Davies went to the same middle-class Liverpool suburban school as Neil, who, like Peter, wanted to be an astronaut. Peter drifted through university, and by age 28 he was an underpaid and seemingly uninspired school teacher. Peter dropped out of the series after 28 Up, following a tabloid press campaign against him after he criticised the government of Margaret Thatcher in his interview. The director's commentary for 42 Up revealed that he later divorced, took up study of the law, became a lawyer, remarried, had children and moved back to Liverpool. He made a surprise return to the series in 56 Up to promote his band, the Liverpool-based country-influenced The Good Intentions. Neil Hughes, from a Liverpool suburb, turned out to be perhaps the most unpredictable of the group. At seven he was funny and full of life and hope. By the time of 21 Up he was living in a squat in London, having dropped out of Aberdeen University after one term, and was finding work as he could on building sites. During the interview he was in an agitated state. At 28 he was still homeless, although now in Scotland; by 35 he was living in a council house on the Shetland Islands off the north coast of Scotland, writing and appearing in the local pantomime. By the time of 42 Up he was living in Bruce's apartment in London and Bruce had become a source of emotional support. He was involved in local council politics, as a Liberal Democrat in the London Borough of Hackney, and had completed a Bachelor of Arts degree from the Open University. By the time of 49 Up, he was a District Councillor in the Eden district of Cumbria, in North West England. Neil stood in the 2010 general election as the Liberal Democrat candidate for Carlisle where he finished third, receiving 6,567 votes. Bruce Balden, as a child, was concerned with poverty and racial discrimination and wanted to become a missionary. He was attending a prestigious boarding school. At the age of seven, he said that his greatest desire was to see his father, who was a soldier in Southern Rhodesia, and he seemed brave though a little abandoned. Bruce studied mathematics at Oxford University and used his education to teach children in the East End of London and Sylhet, Bangladesh. Before 42 Up, he married, and Apted broke the seven-year structure of the films to film Bruce's wedding, which was also attended by Neil. Eventually becoming worn down by teaching in the East End, Bruce currently teaches at St Albans School, Hertfordshire, a prestigious public school. Between 42 Up and 49 Up he had two sons and is happily married to a fellow teacher. In 56 Up he admits he still has a hard time expressing his innermost feelings, in particular to his wife, but is a happily devoted father and husband. Still teaching at a prestigious public school, he has no regrets at this point in his life about the development of his career path. A number of themes have appeared repeatedly over the course of the series. Questions about religion, family, class, happiness and psychological state dominate many of the interviews, as well as inquiries about the worries and concerns subjects have for their future. In addition, questions often take a personal tone, with Apted noting that viewers often respond to his questioning of Neil's sanity or his perception of Tony's success in life as being too personal, but that he has been able to do this because of the friendship he has developed with the subjects over the course of their lives. The series has received high praise over the years. Roger Ebert said that it is "an inspired, even noble, use of the film medium", that the films "penetrate to the central mystery of life", and that the series is among his top ten films of all time. Attempts have been made to repeat the series with subjects in the United States, the Soviet Union, Japan, and South Africa. In a list of the 100 Greatest British Television Programmes drawn up by the British Film Institute in 2000, voted for by industry professionals, 28 Up was placed 26th. The series has also been satirised; The Simpsons' 2007 episode "Springfield Up" is narrated by an Apted-like filmmaker who depicts the past and current lives of a group of Springfield residents he has revisited every eight years. The "37 Up" segment of Tracey Ullman: A Class Act, first aired in 1992, parodies the series. Harry Enfield parodied the series in a spoof titled '2 Up' with his characters Tim Nice-but-Dim and Wayne Slob. The original hypothesis of Seven Up! was that class structure is so strong in the UK that a person's life path would be set at birth. The producer of the original programme had at one point thought to line the children up on the street, have three of them step forward and narrate "of these twenty children, only three will be successful" (an idea which was not used). The idea of class immobility held up in most, but not all, cases as the series has progressed. The children from the working classes have by and large remained in those circles, though Tony seems to have become more middle class. Apted has said that one of his regrets is that they did not take feminism into account, and consequently had fewer girls in their study and did not select them on the basis of any possible careers they might choose. Although it began as a political documentary, the series has become a film of human nature and existentialism. In the director's commentary for 42 Up, Apted comments that he did not realise the series had changed tone from political to personal until 21 Up, when he showed the film to American friends who encouraged him to submit it (successfully) to American film festivals. Apted also comments that this realisation was a relief to him and allowed the films to breathe a little more. The Up series has been criticised by both ethnographers and the subjects themselves for its editing style. Mitchell Duneier has pointed out that Apted has the ability to assert causal relationships between a character's past and present that might not actually exist. Apted has acknowledged this fact, pointing out that in 21 Up he believed Tony would soon be in prison so he filmed him around dangerous areas for use in later films. Apted also portrayed the troubled marriage of Nick earlier in the film, although his time frame for anticipating their divorce was premature. Apted has stated in interviews that his "tendency to play God" with the interviews was "foolishness and wrong." Over the course of the project the programme has in varying degrees had a direct effect on the lives of its participants. The series became popular enough that the participants often speak of being recognised in public. (In 56 Up, Tony tells an anecdote about giving a ride to Buzz Aldrin, and being surprised when a passerby asks him, not Aldrin, for an autograph.) Their opinions of being involved in the series are often mentioned, and vary greatly among the participants. John refers to the programme as a poison pill that he is subjected to every seven years, while Paul's wife credits the series for keeping their marriage together. Michael Apted has commented that one of the big surprises between filming 42 Up and 49 Up was the impact of reality television. The subjects really wanted to talk about how they saw their contribution to the series in the light of reality TV. Paul and Nick were flown back to England at Granada's expense for the filming of 35 Up and 42 Up respectively. Paul was flown back again for 49 Up and visited Symon. Bruce was affected by Neil's plight and offered him temporary shelter in his home shortly before 42 Up, allowing Neil time to get settled in London. Despite Neil's eccentricities during his two-month stay, they clearly remained friends, with Neil later giving a reading at Bruce's wedding. In 56 Up, Suzy and Nick are interviewed together, having become friends due to their shared rural upbringing. Jambers, 1980–1990. Two-part documentary by TV journalist Paul Jambers on Flemish public TV channel about secondary school students in Kapellen, near Antwerp. Talk 16 (1991) and Talk 19 (1993), directed and written by Janis Lundman and Adrienne Mitchell of Back Alley Film Productions. Czech Republic – by Helena Třeštíková. Berlin – Ecke Bundesplatz (Berlin – On the Corner of Federation Square) (1985) by Detlef Gumm and Hans-Georg Ullrich. The documentary follows individuals, families or groups of related people in separate episodes each around one hour. The sequel was broadcast in four seasons on 3sat. Årgang 0 (Generation 0) by TV2 (2000) – The show follows the children, born in the year 2000, from birth. Intervista a mia madre (Interview to my mother) (2000) and Le cose belle (The beautiful things) (2014) by Giovanni Piperno and Agostino Ferrente: the documentaries show two periods in the life of a group of teenagers living in Naples. Bijna volwassen (Almost Grown-up) (1982) – follows a group of 17–18-year-olds. Generació D by TV3 (1989–2019, ongoing). About a group of children from Catalonia. Sweden by Rainer Hartleb. About a group of children from Jordbro, a suburb of Stockholm. USSR/Former Soviet republics – by Sergei Miroshnichenko and Jemma Jupp. A new version of the Up series was started in 2000, 7Up 2000 (2000, Julian Farino), continuing with 14 Up 2000 in 2007 and 21 Up: New Generation in 2014. Apted, Michael (1999). Singer, Bennett (ed.). 7 Up. London: Heinemann. ISBN 9780434007479. Bruzzi, Stella (2007). Seven Up. London: British Film Institute. ISBN 978-1844571963. ^ 28 Up, 42 Up and 49 Up premiered in 2 parts each, and 56 Up in 3 parts, making a total of 13 parts. ^ 2014, deadmonger created 18 Apr 2011, Updated 21 Apr 2017,. "IMDb: Channel 4's "50 Greatest Documentaries" - a list by deadmonger". ^ "Veteran director Michael Apted on his latest film, Unlocked". ^ "The "Up Series" at 56". ^ "Paul Almond, the Director of 'Seven Up!,' Dies at 83". The New York Times. Retrieved 16 April 2015. ^ "Apted: '7 Up should have had more girls'". BBC News. 9 May 2012. ^ "56 Up: Michael Apted on the documentary series that's spanned five decades". Radio Times. 14 May 2012. Retrieved 8 August 2012. ^ Pearson, Allison (16 May 2012). "Seven Up! : A tale of two Englands that, shamefully, still exist". The Daily Telegraph. London. Retrieved 8 August 2012. ^ "Barristers' Chambers : John Brisby QC". 4 Stone Buildings. Retrieved 27 March 2010. ^ "In Memoriam: Sir Donald Logan". Friends of Bulgaria. Retrieved 13 June 2012. ^ Mariana Parvanova (25 March 2010). "Todor Burmow und seine Nachkommen" [Todor Burmov and his descendants] (in German). BNR. Retrieved 13 June 2012. ^ What's on TV. "56 Up". IPC MEDIA. Retrieved 23 June 2012. ^ "Library opened in memory of Lynn Johnson". St. Saviour's School. Retrieved 7 April 2015. ^ "Hitchon, William N." Retrieved 12 May 2009. ^ "Not My Job: We Quiz A Member Of The '7 Up' Series About The Number 8". National Public Radio. Retrieved 1 April 2015. ^ "The Good Intentions". Retrieved 4 May 2009. ^ "Councillors for Eden District - Neil Hughes". Eden District Council. Retrieved 4 May 2009. ^ "Election 2010, Carlisle". BBC News. Archived from the original on 10 May 2010. Retrieved 1 April 2015. ^ a b "Roger Ebert Discusses the Up Series with Director Michael Apted". ^ Mitchell Dunier (2009). "Michael Apted's Up! series: Public sociology or folk psychology through film?". Ethnography. 10 (3): 341–45. ^ Michael Apted (2009). "Michael Apted Responds". Ethnography. 10 (3): 359–67. ^ "All's Well and Fair". This page was last edited on 13 March 2019, at 11:21 (UTC).